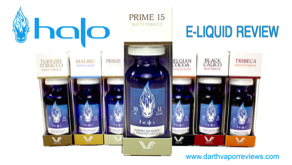 A review of Turkish Tobacco from V-Type, Halo Cigs brand new line of high vg e-liquids. Turkish Tobacco is a combination of sun-cured tobacco flavor with a very, light semi-sweet note. Earthy tobacco dominates the smell. A review of Belgian Cocoa from V-Type, Halo Cigs brand new line of high vg e-liquids. Belgian Cocoa starts with a complex, dried cocoa base and layers in rich, chocolate notes to achieve a gourmet semi-sweet flavor. A review of Tribeca from V-Type, Halo Cigs brand new line of high vg e-liquids. Tribeca is smooth, tobacco notes blended with just a touch of vanilla and caramel to produce a satisfying and sweet finish.